Hello! My name is Kevin Ward and I've been teaching brass, music theory and technology at Music & Arts since September 2015. I graduated from The University of Tennessee at Martin with a degree in K-12 Instrumental Music Education. I proceeded to teach sixth-twelfth grade band, chorus and general music for three years. During that time, I earned my master's degree in Educational Leadership from Trevecca Nazarene University. In 2011, I joined the Army Band as a tuba player and continue to serve our country through music. I was stationed at Fort Lee, VA with the 392nd Army Band from 2012-2015, where I stayed active as an instructor with several local music programs. In addition to being a brass musician, I was the unit's composer and arranger. I relocated to serve with 214th Army Ground Forces Band and 82nd Airborne Division Band at Fort Bragg, NC. I also served as these units' composer and arranger, as well as a brass musician. During my time in the Army, I continued my education by earning a master certificate in Arranging and Orchestration from Berklee College of Music. 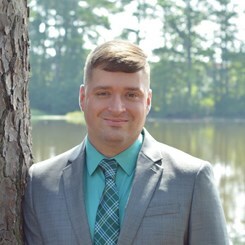 Currently, I am an Orchestra Director for Cumberland County Schools, NC and an Adjunct Professor of Low Brass at Methodist University in Fayetteville, NC. It is an honor to be part of the Music & Arts team as an instructor. Every musician is different! It is very important to diversify your instruction to cater to the needs of each student. A private lesson is the perfect environment to meet these needs and accomplish musical goals. I use a variety of methods to present content to my students, whether it be through visual, audio, or tactile means. My main goal is to teach proper practice habits through active analyzing and problem solving. These skills allow students to progress outside of lessons and propel them towards their musical goals. I find it very important to teach the concept of sound. How can you progress towards a goal when you aren't sure of the quality to which your goal should be met? We should always strive to be better musicians everyday. With the proper instruction and tools, you will be on your way to musical success! Mostly importantly, music should be FUN! Feel free to contact me with any questions at the store 910-864-8808 . I look forward to meeting you and making some music together!